Those of you who have this critter, how easy is he to put clothes on? I see it's for Studio but not Genesis-based so I'm guessing autofit won't work. Will grab him at the catchup sale if he can be dressed in other than a loincloth or whatever that thing is he's wearing in the promos. Edited to add: Please don't suggest I use anything dynamic to do this. Be it Studio or Poser, dynamic clothing gives me the willies. Scarier than any monster is the cloth room/cloth plugin. The figure uses Triax weight mapping which is Studio only. The figure is not Genesis-based, as you said, thus no autofit. So, no clothes unless they are made for the figure or there was some XD support which I can't really see happening. :sigh: Oh well, was just a thought. On my wishlist he goes then. I still plan to have him, just not for my current project. Anybody know if there are any M4 or even Genesis based relatives of his around? It's essential to the plot that the scary looking alien who gets arrested is wearing 19th/20th century Earth-style clothes. Some variations on the theme... Rendered in Bryce 7.1 pro. Agate, glass and opalescent paint. Sweet! It looks like I could reach out and touch them. Great composition, I'll "thirded" the comments directly above. This is my new favorite character. Hands down one of the nicest independent figures I've ever seen. I, sir, am in awe. Even more awesome in 3D? - rendered entirely in Bryce 7.1 Pro - one native render, no postwork. Red and Cyan (left/right) 3D viewing glasses required to... er... view. I'm wondering if this is an entirely new model or not? I recall purchasing a Cthulu here at DAZ a few years ago, but it's not in my history anymore. Is this a totally new model? Another Bryce 7.1 Pro render... still playing with this model. Any chance this will also be updated to work in Poser like Genesis? 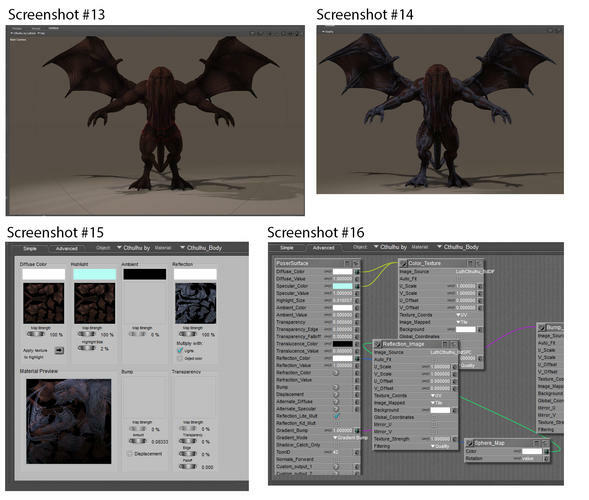 I think it was made with DS4.5 so all you would do is make the companion files to load it into poser. I meant if it would be updated to work with DSON and Poser without needing to install DS, just like Genesis and the other DSON updated products. 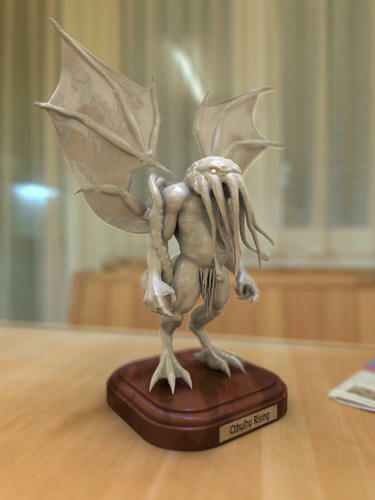 Has anyone tried importing Cthulhu Rising into Poser? I was hoping that Luthbel's store will go on sale this month, and that if I can afford it, I would get this character while its on sale (assuming it goes on sale). I'm pretty sure someone did, successfully (though I think materials needed adjusting). Hi everyone - long time customer, first time posting here. Just wanted to say that I downloaded Daz Studio 4.5 Pro under the current promo for the express purpose of seeing if I could convert this wonderful(ly evil) figure into Poser. Took a bit of figuring out since I am a total Daz Studio n00b, but yes, it is very possible, and it ports over nearly flawlessly including all of the morphforms. The only material editing I had to do was to modify the reflection and highlight colors so he didn't appear to be glowing blue. 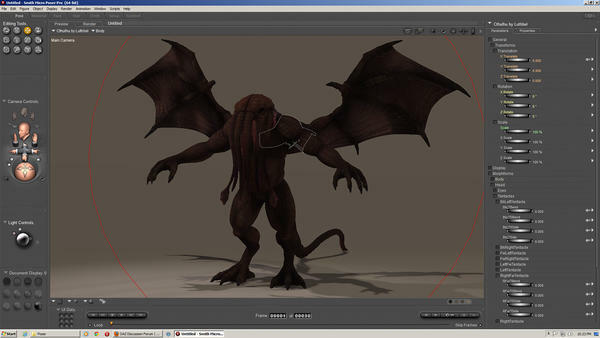 Attached (assuming I did the upload correctly) is a screenshot of the figure in Poser Pro 2012. Luthbel, as others have said, amazing job! Thanks again! Yeah, Luthbel produces amazing stuff!! 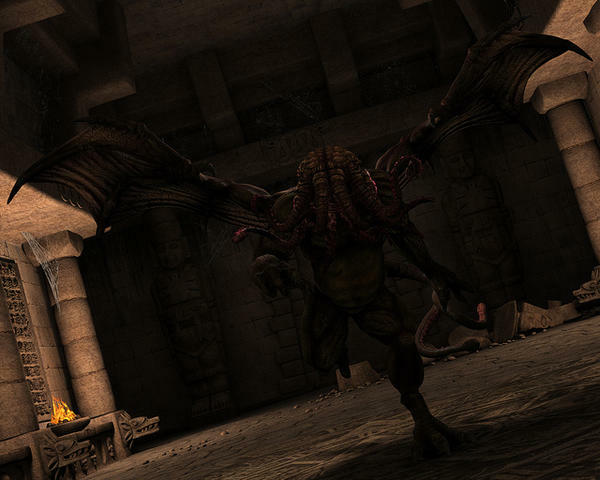 My take on Cthulhu in DAZ Studio. I rendered it September last year. Would you be willing to share the process you went through step-by-step? Sure, if you don't mind being bored out of your skull by my long-winded, over-detailed, and probably flat-out wrong process. Like I said, probably much better/easier ways to do it, but here's what I did (also please note I'm on Windows 7, so this is also probably slightly different if you're doing it on a Mac. Also, I'm using Poser Pro 2012, so it might be slightly different if you have Poser 9.) I have screenshots below the wall o'text, but since the forum limits me to five attachments, I had to combine some. So screenshots #1-4 are in the first image, #5-8 in the second, #9-12 in the third, #13-16 in the fourth, and #17-18 in the fifth. 1. Open up your Poser Runtime folder. Go to the "Geometries" folder. Create a new folder in there called "Cthulhu." 2. Go back to the root of the Poser Runtime folder, go to "Libraries," then "Character." Create a new folder in there called "Cthulhu." 3. 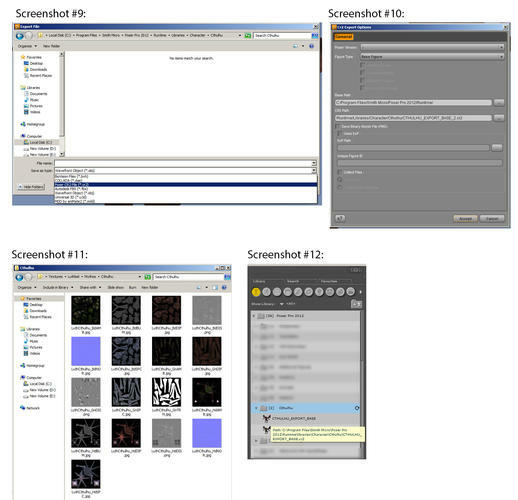 Go back to the root of the Poser Runtime folder one more time, go to "Textures." Create a new folder in there called "Cthulhu." It seems Poser Pro 2012, at least, is smart enough to recognize the links between the files automatically if you place them in those directories, because I never had to choose what files linked to what. 4. Start up Daz Studio 4.5 Pro. Special note for Windows Vista / 7 / probably 8 users: if you're dumb like me and have the Poser Runtime folder you're going to be doing this in under C:\Program Files\Smith Micro\Poser(whatever), you may have to run Daz Studio as Administrator - otherwise good ol' Microsoft will say you "don't have sufficient permission to create the files." 6. Below the pulldown you should see a few rows of options. If the one that says "General" is not already expanded to show the suboptions below it ("Transforms," "Translations," "Rotation," etc) then expand it. Click to select the option that says "Mesh Resolution." Cthulhu Rising has only one Resolution Level ("Base") so you don't have to mess with that option. However, you'll see a slider with the words "SubDivision Level," which will be set to "1." Drag the slider all the way to the left so it reads "0." See screenshot #3 below for details. 7. This one caught me for a little while. I don't believe, at least in the Windows version, that Daz Studio automatically loads the "Surfaces (Color)" tab as an option. So if you don't see a tab anywhere that says "Surfaces (Color)," go up to the Window menu, then go to "Panes (Tabs)," then click on "Surfaces (Color)." See Screenshot #4, below. The tab should now appear somewhere in the vertical menus - probably on the left. I dragged the tab over to the right underneath the Content Library tab, but it's just personal preference. 8. Click on the "Surfaces (Color)" tab. Expand the "Cthulhu by Luthbel" menu that shows up, click on "Cthulhu by Luthbel." All four items you see should become highlighted in yellow. On the menu to the right of that, scroll allllllllll the way down to the bottom and look for an option that says "(3) UV Set." It should show "new." Change this to "Default UVs." See screenshot #5 below. 9. Now go up to the File menu and choose Export. Browse to your Poser Runtime folder, then to Geometries, then to Cthulhu (the folder you created back in Step 1). 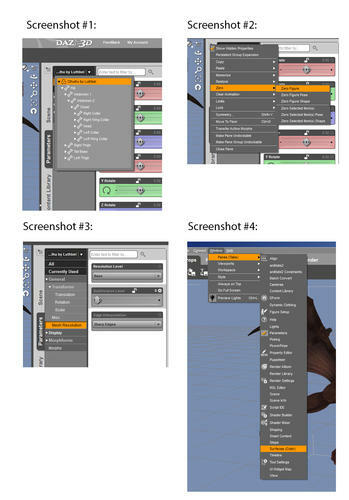 From the "Save As Type" pulldown, select "Wavefront Object (*.obj)" See screenshot #6 below. Give it a name - any name, I just used "CTHULHU_EXPORT" - and click Save. 10. You're going to get a popup box. In the pulldown that says "To:" select "Poser (1 unit = 8 feet)" See screenshot #7 below. Uncheck the boxes that say "Ignore Invisible Nodes" and "Use Bone Welds," click on the circle next to "Use Existing Groups," and uncheck the box that says "Write Material Library." The box should now look like it does in screenshot #8 below. Click "Accept." Daz Studio will chug for a short time. 11. Getting there, honest! Click on the File menu and choose Export again. This time, browse to your Poser Runtime folder, then to Libraries, then to Character, then to Cthulhu (the folder you created back in step 2). Now in the "Save As Type" pulldown, select "Poser CR2 File (*.cr2)" See screenshot #9 below. Give it a name - again, any name, I just used "CTHULHU_EXPORT_BASE" - and click Save. 13. Close Daz Studio. You don't need to save any changes. 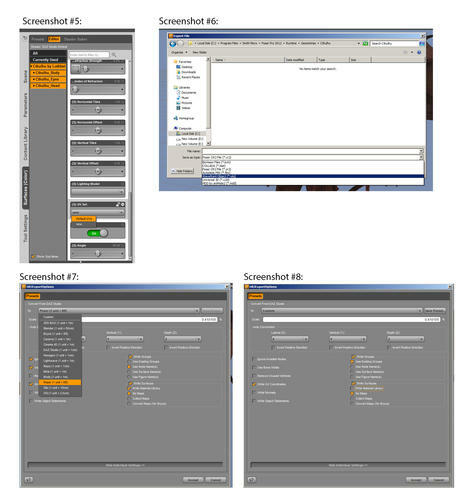 Now browse to your Daz Studio Runtime folder. In my case, this is in My Documents -> DAZ 3D -> Studio -> My Library -> Runtime. 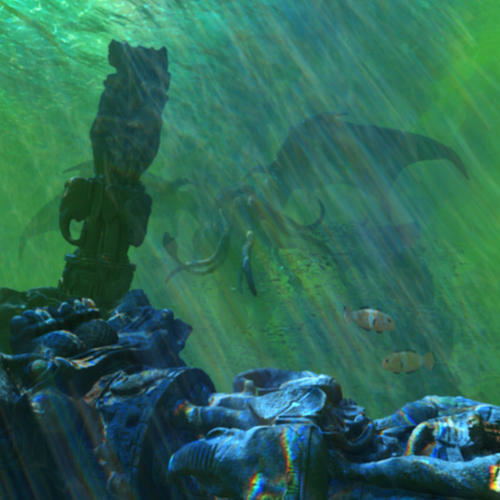 From there, navigate to "Textures," then "Luthbel," then "Mythos," then "Cthulhu." You should see a bunch of jpg and png files (see screenshot #11 below). Select all of them and Copy them. 14. 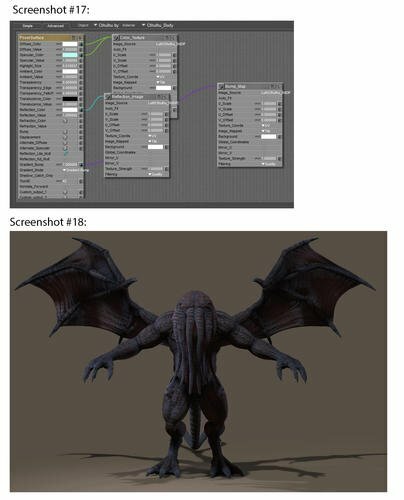 Now navigate to your Poser Runtime folder, then to "Textures," then to "Cthulhu" (the folder you created in Step 3). Paste all the files in there. 15. Start up Poser. 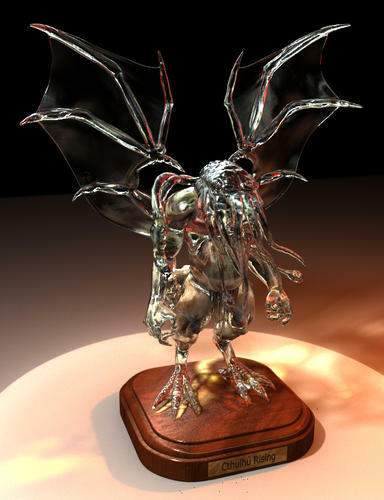 Go to your Library, click on the Figures icon, then on your Poser version, then on Cthulhu. See Screenshot #12 below (I blurred out the other folder names to protect the guilty). You should only have one icon that looks like Cthulhu here - I have two because I went through this whole process again to create this instruction set. Double-click on the icon to load it. 17. Go into Poser's Material Room. Select "Cthulhu_Body" from the "Material" pulldown menu. If you're in Simple mode, you'll see it looks like what you see in screenshot #15 below. Notice how in the Material preview the blue part doesn't overlay the rest correctly? Click on the "Advanced" tab. You should get something that looks like what you see in screenshot #16 below. 18. This view still intimidates me even after years of working with Poser. But in this case, the fix is pretty easy. Starting at "Reflection Color" on the left, you'll see a blue line going to "Sphere Map," and from there, there's a green line going to the box that says "Reflection_Image." Click on the "Sphere_Map" and delete it. The blue and green lines disappear, but the "Reflection_Image" box should still be floating by itself. 19. Click on the "plug" next to "Reflection_Color" on the left and drag the line that appears to the "plug" in the top-left corner of the "Reflection_Image" box. Results should look like what you see in screenshot #17 below. 20. 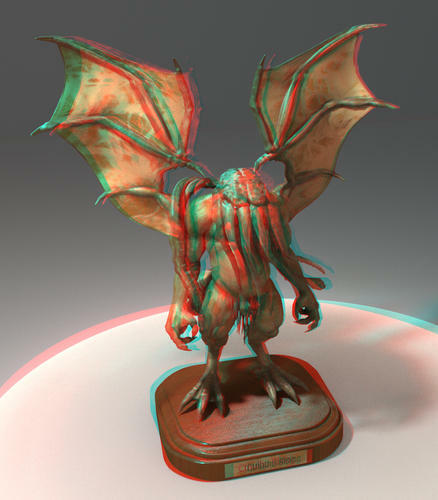 Now select "Cthulhu_Head" via the Material pulldown and repeat this same process of deleting the Sphere_Map and reconnecting the Reflection_Image. Then select "Cthulhu_Eyes" and do it again. Thank Azathoth there are only three materials. 21. Go back to the Pose room and render. Now the reflections are properly lined up, so his entire body is glowing an eerie blue, and the eyes look right. See screenshot #18 below. If you don't like the blue glow, you can go back into the Material room, switch back to Simple mode, and play around with the settings for the Highlight and Reflection until you find something you like. 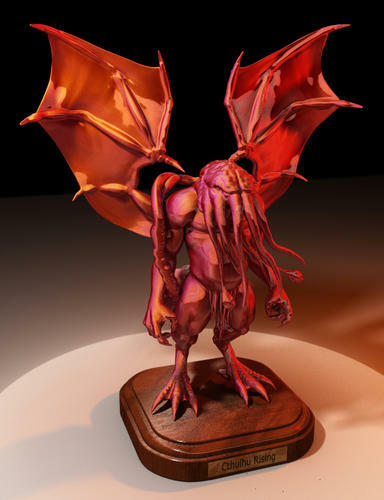 If you just want plain ol' Cthulhu with no glow at all, just set the Reflection and Highlight colors for Cthulhu_Head and Cthulhu_Body to black. Sure, if you don't mind being bored out of your skull by my long-winded, over-detailed, and probably flat-out wrong process. On the contrary I love lengthy, detailed explanations and don't mind taking a roundabout way - you're talking to the person who has "frankensteined" probably most Poser people's heads to each other's bodies instead of using WW to convert clothing! Thank you for your time in explaining everything so clearly and illustrating each step of the way. Everything has been saved, categorized and is ready to use during my upcoming vacation. Really, I can't thank you enough for this!